Cnr. 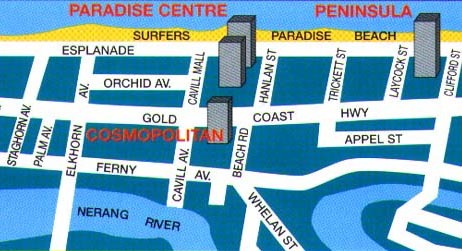 Gold Coast Hwy & Beach Rd., Surfers Paradise, Queensland. 4217 Australia. Cosmopolitan is the perfect accommodation solution for an affordable Gold Coast getaway. Situated opposite Cavill Avenue, Cosmopolitan offers fully self-contained one bedroom apartments in the heart of Queensland’s Surfers Paradise. 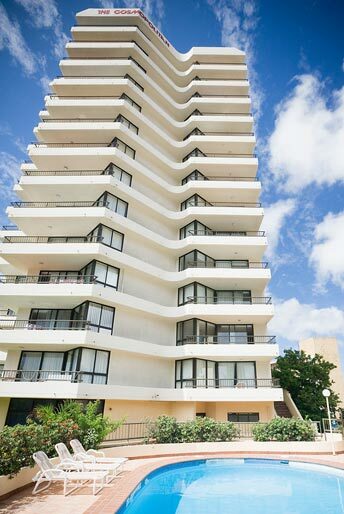 Every apartment has a private balcony with the striking ocean or Hinterland views that only the Gold Coast can offer. The resort’s leisure facilities include two swimming pools, a rooftop sunbaking area, spa, sauna and BBQ facilities. With the world-famous Surfers Paradise beaches, Cavill Mall shopping precinct, restaurants, cafés and nightclubs just a short stroll away, guests have the chance to be part of the action or relax and unwind away from it all. One Bedroom Apartment - Available with one queen or double bed.